There's a $100,000 prize waiting for you if you can read minds, see the future or talk to the dead. As long as you can prove it, that is. Submit your superpower to scientific testing, and if you pass you'll be the first to win the prize in its 37-year history. The Australian Skeptics have offered the money, to be awarded to anyone who can prove they have psychic or paranormal powers, since it was founded in Melbourne in 1980. How does one prove that they can speak to the dead? Just by saying personal information? There are also $1,000,000 prizes offered to those who can prove Darwinism true, put out by biblical creationist groups. Obviously it can and has been proven numerous times. So much so it makes them look like flat-earth nut jobs in the face of the blatantly obvious. Yet despite that no one's claimed the prize. Why? Cause the prize means nothing. There're multiple organizations (mostly skeptic or religious groups), each with their own agendas, who've offered prizes for people to prove them wrong. It's just there to further an agenda that all these organizations offering these 'prizes' have. None of them actually intend on presenting these prizes to anyone no matter what evidence the challenger presents. It's just a pathetic means of furthering their dogma, nothing more. ^ I agree, these 'prizes' are meaningless, like the James Randi one was. In that spirit... I am offering a million dollars to anyone who can prove to my satisfaction that an elephant is not a fish. Is it safe to assume that paranormal doesn't exist? Well, science is the study of this world, no wonder it can't get the things from the other. Paranormal is just too paranormal to be scientifically analyzed. 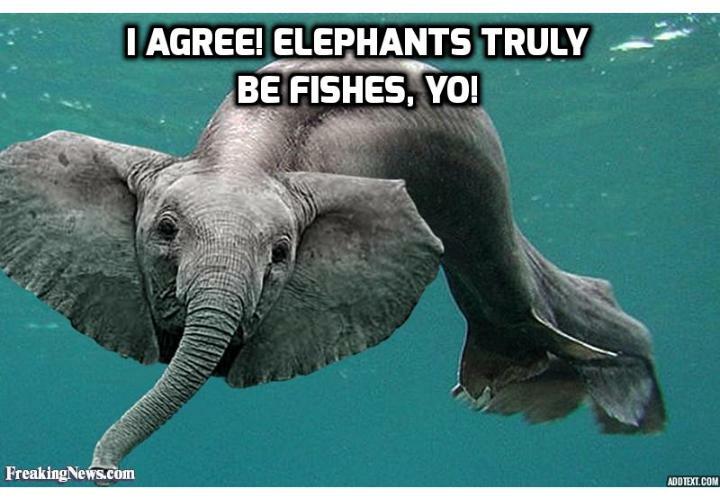 I am offering a million dollars to anyone who can prove to my satisfaction that an elephant is not a fish. None of them actually intend on presenting these prizes to anyone no matter what evidence the challenger presents. It's just a pathetic means of furthering their dogma, nothing more. Not really. They really do intend to present it but sadly they won't. They just use the wrong methods. Paranormal is a thing somewhere between our imagination and the very essence of the Universe. I have been a skeptic for many years, but I would be lying if I said that I wasn't hoping that one day, someone would uncover something, anything, that science has missed. This is the reason that I have come to this site for years even into my more rational days. I am convinced at this point in my life that if there is some kind of supernatural element that does exist in the allowable universe, humans lack the ability to tap into it. We cannot manipulate, control or perceive its presence without some kind of physical output and if that were the case, it would be measurable and already documented by science. The believer community's attack on science and research on this subject is a bit like yelling at an ATM for shorting them money during a withdrawal. Science is a process and a scientist is not in the business of proving a 'negative' and therefor will refrain from engaging in any speculative field that is likely to lead to no conclusion(bad science). Extraordinary claims require hard evidence to back it up and what people provide as evidence suchas "feelings" or loosely associated outcomes as proof, it already nullifies the 'hard evidence' part of the argument. I think the reason that a prize is offered is to draw out the vultures that would be otherwise draining the life out of those unfortunate souls that will pay and arm and a leg to hear a line of BS for their own comfort. Sadly, exposing these people doesn't actually do anything since they end up recovering their careers anyway. James Randi has a name for these people: "The unsinkable rubber ducks". No matter how hard you sink them, they'll just pop up some place else. I think it amount to a sense of insecurity for those who have doubts or disbelieve in the paranormal....They had rather waste their time trying to disprove it rather than putting their energy into trying to find out if these things do exist. I frankly have never seen a ghost but that does not mean they don't exist. You want "proof" of the paranormal, the Shaolin do things western science can't explain. There's a serious dissociation between the use of Chi in martial arts and people's views of the "paranormal". Even Lovecraft talked about such a disconnect in the beginning of the Call of Cthulhu, "The most merciful thing in the world, I think, is the inability of the human mind to correlate all its contents". Some of the more interesting declassified CIA files that can be viewed are documents that were involved in the Stargate Project. This was a program which was funded by the U.S. Army and was part of the inspiration for the Netflix drama Stranger Things. Rolling Stone describe how the Stargate Project was used to research paranormal phenomena which could be used by the military, which included things like mind-reading, remote viewing, and psychokinesis. The United States government is even reported to have hired a psychic headhunter to recruit candidates to join the program. The movie The Men Who Stare at Goats is also based on the CIA’s Stargate Project and described how those involved would try to develop and use their telekinetic powers to kill animals just by using their minds. Geller was supposedly "debunked" by skeptics, but there was also an incident during the CIA tests where Geller was unable to remotely view a drawing. It's like a hound trying to track a scent with an overwhelming smell nearby. All that negative energy, especially from skeptics making a big production out of disproving psychics, likely caused Geller enough trouble that he couldn't claim the prize. The CIA experiments didn't surround him with hostile skeptics and so had far better results. But information on the Stargate Project goes along with what many of us have said. Those with real psychic ability would be considered a danger to the general public. For example, nuclear launch codes would be at the top of some people's list for a psychic to read. Anyone demonstrating strong abilities would likely be "recruited" or killed "for the greater good". The Inquisitor article uses different movie references, and I'll add one more. In the movie Next (2007), Nicholas Cage's character says "If I do what you want, they'll keep me in this chair forever". Oh Geller. Well. That proves everything. Close shop folks. We've got legit psychic evidence. No need for us skeptic anymore. And this is exactly why most well known 'highly skilled psychics' are frauds. If someone genuinely had significant psychic abilities, it would have profound implications in our modern world. They aren't Elephants, are they? You said Elephants, plus of course Sea Mammals breathe air by coming to the surface, so really not a point...you still owe me a million. There is a scientific understanding for classification that when followed will give a satisfactory explanation as to why physical properties make up a species, family, etc. One does not have to accept a definition of a taxonomic label, but what other system is there to define any creature following a logical structure? Structures define all levels of communication; you can invent your own language, but if that is not the agreed dialect of the masses, what use is it? But Mr Kelly, for example, is a social worker who joined the movement 20 years ago after seeing "unscrupulous" people take advantage of his grieving clients. The Million Dollar Prize was tested a number of times. The rules were simple. The person being tested would propose the test. The only requirement by the side offering the prize was that the test could not be a simple game of chance. People did try out but all failed. Many believed they could do the things they claimed. Dowsers were often surprised at their failures. But there were cheats that tried. The x-ray person tried to view kidneys and guess one side in all cases. Turns out that one side is chosen over the other side in kidney donations. Not a cheat but an astute effort to get the odds on their side. There are the whiners that upfront say it is rigged against them. It certainly is if you are a fraud. Here is an atypical whine. " The applicants for Randi's prize have to prove themselves to a very high statistical standard far beyond the level that is generally considered proof in science experiments. " This blog entry is confusing a positive experimental result with proof. It shows that the person does not understand that experiments are often done to a level that is a balance between cost and results. The writer thinks that a 1 in 20 chance of a false positive is acceptable. It certainly is not the standard used in the MDP. The 95% confidence level suggests that around 5% of published results are wrong due to statistical chance. It is not sloppy work. It is not poor experimental design. It is simply due to chance. Odd thing is that around 6% of homeopathic drug reports are positive. Kind of expected. The simple fact is those claiming psychic powers are not tested. They just say it is so. I wonder if testing would surprise them as are dowsers that get tested. What happened to the human creativity along the way to present?